The menagerie of advertising pitch characters and spokes-beasts is about to get a new member as a maker of pricey pet foods introduces a campaign with a furry know-it-all as the star. 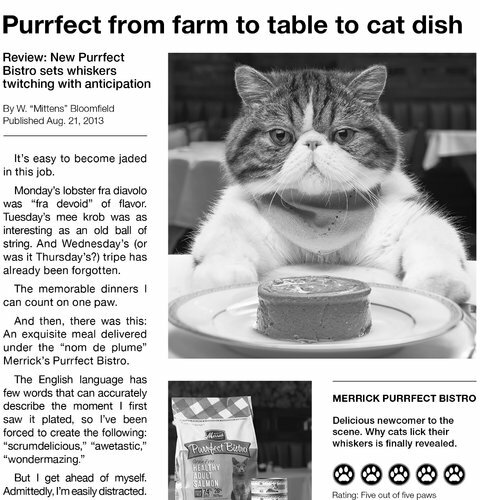 The campaign, which started in August, is for the new Merrick Purrfect Bistro brand of superpremium cat food from Merrick Pet Care, a leader in the growing category of natural and organic pet foods. Purrfect Bistro is a line of 21 products, in cans and bags, that replaces a Merrick brand called Before Grain. Print and online ads for Merrick Purrfect Bistro — along with the brand’s presence in social media like blogs, Facebook, Klout and Twitter — will be fronted by an American Shorthair cat named W. (Mittens) Bloomfield, a feline food critic who is as finicky and opinionated as any human counterpart. The centerpiece of the campaign is a Web site, styled like a food blog, where the critical cat will hold forth on favorite meals — all of them, not surprisingly, featuring Purrfect Bistro products. The campaign arrives as competition is intensifying in the higher-priced segment of the pet food market, particularly involving brands that are billed as organic or natural. Products are arriving from pet food giants like Mars, Purina and Procter & Gamble as well as family-owned and entrepreneurial firms like Ainsworth Pet Nutrition, Blue Buffalo and Merrick Pet Care. For instance, the September issue of Good Housekeeping magazine, as mainstream a media outlet as there is, carries ads for nontraditional pet food brands like Blue, Iams So Good, Nutro Natural Choice and Rachael Ray Nutrish Zero Grain. By making the Purrfect Bistro cat character a foodie, the campaign should “appeal to that passionate pet parent” who is more than likely a foodie when it comes to what he or she eats, Mr. Brace says. The idea is that the new brand “offers the variety, taste, texture, protein and quality they’re seeking” in cat food, he adds. 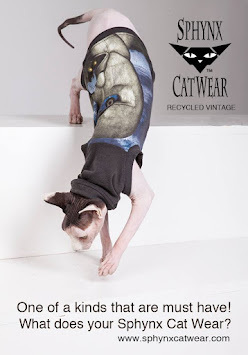 The humor in the campaign reflects how “Purrfect Bistro is intended to be a lot more fun and whimsical, and perhaps female in spirit, than the Merrick dog line,” says Emily Buchanan, senior principal and chairwoman of brand marketing and social engagement at Carmichael Lynch Spong. The blogs on which the campaign will appear include food-focused and pet-focused Web sites like CatChannel, Eater, Foodbeast, Food Republic, Pet360 and Serious Eats. The involvement with Klout is centered on a Klout Perks, or benefits, program, offering recipe samples that are intended to inspire consumers to write reviews in the vein of the cat critic character.